The P-18 or 1RL131 Terek (also referred to by the NATO reporting name "Spoon Rest D" in the west) is a 2D VHF radar developed and operated by the former Soviet Union. The P-18 early warning radar is a development of the earlier P-12 radar, the P-18 radar being accepted into service in 1970 following the successful completion of the program. The P-18 was developed by the SKB Design Bureau, a division of State Plant No.197 named after V. I. Lenin who developed the previous P-12, the predecessor of the current Nizhny Novgorod Research Institute of Radio Engineering (NNIIRT). In 1979 a new secondary IFF radar the 1L22 "Parol" entered into service to complement the P-18, unlike the previous secondary radar NRS-12 (NATO "Score Board") the new interrogator was carried on a separate truck. The P-18 is still in service today and was widely exported, many companies offer upgrade options to improve the performance and reliability of the radar and to replace out-dated components. NNIIRT offers an upgrade package for the P-18 which includes the installation of a solid state transmitter and receiver, automatic jammer suppression equipment as well as PC based signal processing, test and interface equipment. These upgraded variants of the P-18 can be referred to as the P-18M, P-18-1 or P-18-2 depending on the manufacturer, modification and radar nationality. The P-18 was superseded by the 1L13 "Nebo" VHF surveillance radar in 1984. Currently, the Russian-Belarusian company Defense Systems provides upgrades for P-18 radars. Also Retia, a Czech civil and military electronics company, developed its own, fundamental modernisation of the P-18 under the name ReVEAL. It is now solid state, digitized and fitted with upgraded IFF system, while allowing to utilise also the legacy IFF. The whole equipment is repackaged into a standard container and already sold in several dozen units. The P-18 shares many similarities with the earlier P-12NA and like the P-12 it is mounted on two Ural-4320 truck chassis. The P-18 features many improvements over the P-12 including increased performance, precision and reliability. The radar was developed to work independently or as part of a C3 system directing SAM and aircraft to hostile targets, the truck mounted design provided the radar with high mobility. The P-18 uses a single antenna accomplishing both transmission and reception. The antenna is composed of sixteen Yagi antennas mounted in sets of eight with one set above the other. The radar antenna is mounted on the truck used to transport it improving mobility and the radar also features a mechanism which allows the antenna height and elevation to be altered during operation. Azimuth is scanned mechanically by the antenna with a rotation of 10 r.p.m, the original P-18 used three indicators, including two plan position indicators in addition to a back-up A-scope. Like the P-12 the radar features automatic frequency control with four pre-set operating frequencies, moving target indicator to eliminate passive clutter and active jamming, the radar could also display tracks from another radar it was paired with. The original P-18 used a coaxial cavity resonator transmitter, vacuum tube receiver with transistor based preamplifier and a vacuum tube/pin diode based duplexer. A secondary radar for IFF is generally used in conjunction with the P-18, either the NRS-12 or the later 1L22 "Parol". There is few modification and variants of P-18 radar that allow him to be still in use and most of them substantially extend original capabilities. P-18ML – ground-based long-range VHF surveillance radar P-18ML is offered as the modernized follow-on to its prototype, the analogue P-18. Produced in LiTak-Tak (Lithuania). As a result of modernization the radar's detection performance is efficiently improved. Modernized radar features automatic tracking capability as well as data receiving from other radar sensors. Data can be exchanged over a variety of communication channels in approved format. During development of modernization electronic set for P-12M radar it was developed digital data receiver that could be used for both P-12 and P-18 radar modernization by Serbian company Iritel. Today that set is in use by Serbian army for modernized P-12 and P-18 radar. This data receiver enables use of remote control for radar using optical cable at distances from 100 to 500 meters. The P-18 was operated by the Soviet Union from 1970 and though it has since become obsolete it was passed down to successor states after the fall of the Soviet Union. The radar continues to serve in many client and third world states who received the P-18 from the Soviet Union by export. Many P-18 have been upgraded and continue to serve in the military and air traffic control role across the world. Soviet Union – Passed to successor states. 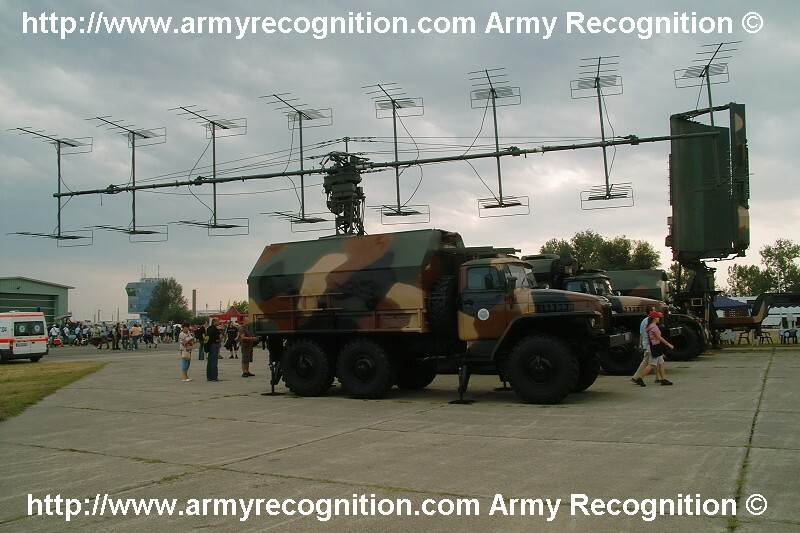 Hungary – Displayed during Kecskemét 2007 Air and Military Show, upgraded by HM Arzenal from 2000. Kazakhstan – Upgraded by Aerotechnica MLT. Poland – Known as "Laura" locally. Finland – Known as "Maalinosoitustutka 2", used for anti-aircraft artillery as well as now-obsolete S-125 Neva/Pechora batteries. The P-18 has served in several conflicts in the Middle East, Europe and Asia. One unusual feature of the P-18 is its counter-stealth capability. Since the radar uses metre-length wave VHF, the shaping features and radar absorbent materials used on stealth aircraft are less efficient, allowing VHF based radars to detect targets at a greater range than centimeter or millimeter wave radar which stealth aircraft are optimized against. The presence of a P-18 radar in Yugoslavia during the Kosovo War is believed to have contributed to the loss of a US F-117 Nighthawk during the conflict. Wikimedia Commons has media related to P-18. ^ a b c "Nizhniy novgorod research institute of radio engineering". NNIIRT. 2008. Retrieved 2008-12-28. ^ a b РЛС П-12 (in Russian). pvo.guns.ru. 2000-08-07. Retrieved 2008-12-29. ^ a b c Christian Wolff (2008). "P- 18 "Spoon Rest D"". Retrieved 2008-12-29. ^ "Kecskemet 2007 Hungary Air and military show pictures gallery" (in French and English). Army Recognition. 2007. Archived from the original on December 12, 2011. Retrieved 2009-01-03. ^ "P-18 Radar". HM Arzenál Electromechanical Stock Co. Retrieved 2009-01-03. ^ "Modernised P-18 radar". Aerotechnica Ltd. 1992–2008. Retrieved 2009-01-03. ^ "Radar Equipment". Ministry of National Defence Republic of Poland. 2005. Retrieved 2009-01-03. ^ "Ilmatorjuntamuseo, Tutkat". AntiAircraft Museum, Finland. Retrieved 2009-08-09. ^ Antonio Sánchez Andrés (2006-11-07). "Political-Economic Relations Between Russia and North Africa" (PDF). Working Paper. Retrieved 2010-10-31. ^ "Russian Low Band Surveillance Radars". Air Power Australia. 2008-12-29. Retrieved 2008-12-29. This page was last edited on 21 March 2019, at 23:16 (UTC).